In order to make your business a success, you should be spending more time and resources in converting existing traffic than in acquiring more traffic. When you work with the mindset of increasing sales by just sending more traffic to your website, your cost per acquisition tends to be high and your revenue per acquisition tends to be low. So you may eventually end up making less profit and sometimes even loss. The best way of converting existing traffic into sales, is by mapping the entire conversion /sales process from lead generation ads to post sales follow up and then looking for biggest drop-offs from one step to the next. Use this report, to determine the biggest drop offs from one step of the funnel to the next. These drop offs, can help in explaining which part of the website/ conversion process needs urgent attention. In order to truly benefit from funnel visualization reports you must know how this report actually works. If you create wrong funnels then you won’t be able to map customers’ conversion journey correctly and without correct mapping, there would be no conversion optimization. In Google Analytics, a funnel is a navigation path (series of web pages) which you expect your website users to follow, to achieve website goals. A funnel is made up of a goal page(s) and one or more funnel pages (also known as the funnel steps). 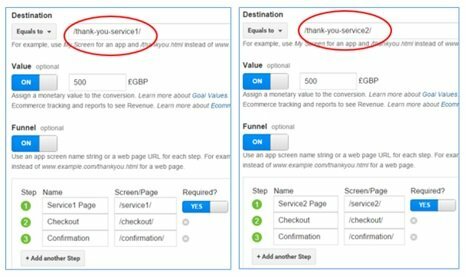 Through funnels you can determine, where users enter and exit the conversion/sales process. You can then determine and eliminate bottlenecks in your conversion/sales process in order to improve the website sales. 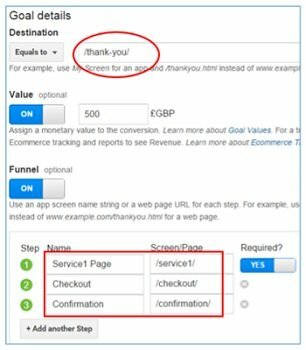 You can set up to 20 pages as funnel pages in GA. However don’t do that (more about that later). #1 Goal funnel – it is a series of web pages which you expect your website users to follow, to complete a non-transactional goal like ‘newsletter signups’, ‘downloads’ etc. #2 Sales funnel – it is a series of web pages which you expect your website users to follow, to complete a transactional goal like placing an order on the website. Checkout process is a good example of a sales funnel. #3 Multi channel goal funnel – it is a goal funnel which takes into account, the role played by multiple marketing channels in the conversion path. #4 Multi channel sales funnel – it is a sales funnel which takes into account, the role played by multiple marketing channels in the conversion path. In this article, I will explain Goal and Sales funnels in great detail. But I won’t cover multi channel goal/sales funnels. #2 How to accurately interpret/read the funnel visualization report. #3 How to optimize the goals/sales funnel to increase sales. Create a funnel only when there is a well-defined path you can see/expect your website users to follow, to complete your website goal. If a website goal (like file downloads) can be easily achieved, by following dozens of different paths, then do not define a funnel. If you do, it won’t help you much in understanding how different traffic segments convert. Instead create filtered views (like one view for organic traffic, one for paid search, one for social media etc). How do I decide pages for my funnel? The answer is pretty simple, use those pages as funnel pages, which are most frequently viewed prior to goal completions and/or transactions. Use the page value metric to determine such pages. You can also use the ‘Reverse Goal Path’ report (under Conversions > Goals in your GA view) to determine the actual navigation paths that triggered goal conversions, and the number of conversions each navigation path triggered. By default the ‘Reverse goal path’ report, shows the last 3 steps, user took, before viewing the goal page. The navigation path that has triggered maximum number of conversions, should be used as a funnel. You can also apply advanced segments to the ‘reverse goal path’ report. Note: You can only create funnels for URL based goals. So if you want to create funnels for event based goals then you need to use virtual pageviews. 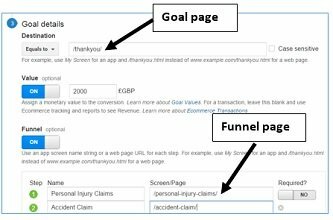 When you set up a goal or funnel page you specify only the Request URI. The Request URI is what that comes after the domain name. For example in the URL: https://www.abc.com/event-education.aspx, the request URI is ‘/event-education.aspx’. If you want to set up different funnels for same goal, then consider using different goal URLs for each individual funnel. For example, let’s say, you want to understand, how people who view the service1 page, convert in comparison to the people, who view the service2 page on your website. 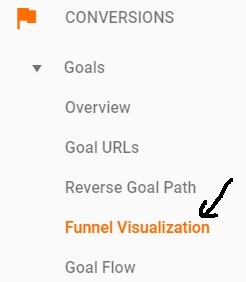 Now you need to set up two different goals and two different funnels in your GA view, to understand this conversion behavior. 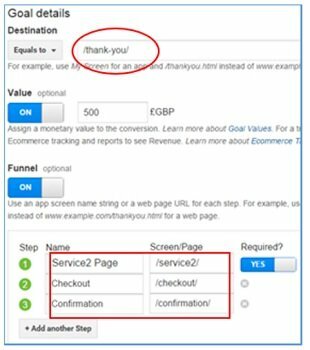 Let us suppose the URI of the goal page for the two funnels is ‘/thank-you/‘. This happened because, both goal completions and goal conversion rate is independent of the funnel steps. After such setup, you would see correct number of Goal completions and accurate goal conversion rate for each goal and funnel. There are lot of websites out there which have got URLs in uppercase and/or lowercase letters or in some weird combination of upper and lowercase letters. So if your goal/funnel pages did not match the capitalisation of visited URLs then you will get incorrect data in your funnel visualization reports. The capitalisation issue is one of the most overlooked issue, according to my analysis of hundreds of GA accounts. 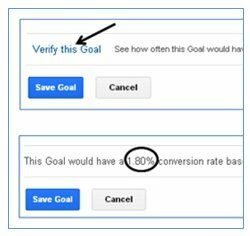 You should never specify a goal value for transactional goals, as this can inflate the revenue metrics in Google Analytics reports. You should assign monetary value only to non-transactional goals (like ‘file downloads’, ‘newsletters signups’ etc), so that Google Analytics can calculate the ROI and per session goal value. Note(1): Goal value is the value of a website goal which is determined by calculating what you will get, when a goal is achieved. For e.g. if you sell leads then revenue per lead can be the value of each goal. Note(2): A non-transactional goal conversion is counted, only once during a session, per user. For example if PDF file download is one of your goal, then Google Analytics will count only one conversion in a single web session (or visit), no matter how many times a user downloads the PDF file. One of the most common and very difficult issues to resolve, while setting up funnels in GA, is to make sure that correct regular expression (or REGEX) is used for goal and funnel pages. Like in our case, there is a 100% continuation rate from shopping cart page to check out page and 100% continuation rate from checkout page to the order review page. This usually happens when multiple funnel steps, match same web pages. If you look at the funnel set up above, the first step is the home page (/) which matches with all other funnel pages, as they all contain ‘/’. The match type (like ‘Regular Expression’, ‘Begins With’, ‘Equal to’) you select for URL destination goal is continued throughout the funnel set up. So if you select ‘regular expression’ match for the URL destination goal then it will be the same match type for each funnel step. Similarly, if you select ‘Begins with’ match for the URL destination goal then it will be the same match type for each funnel step. Remember funnel steps can accept regular expressions. 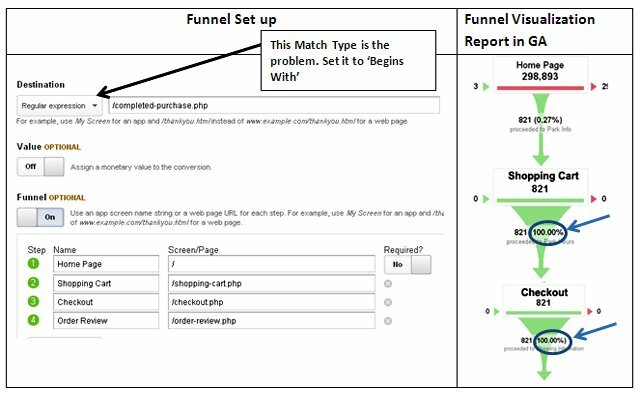 In order to solve the 100% continuation issue, in the funnel visualization report here, you need to re-write the regex for the goal page and each of the funnel page. Then Google Analytics can match this regex, with signup page in any directory. Note: You can also use wild cards to define a goal or funnel page. For example, you can use *.pdf to define a goal page. Just like 100% continuation rate, you can also see 100% exit rate in your funnel visualization reports whenever two or more funnel steps match same web pages. That means you funnel conversion rate could be different for the funnel in which the first step is not marked as required. Here, the order in which the ‘required funnel page’ was viewed during the GA session, which results in conversion, does not matter. So it is not required that a website user, must first visit the required funnel page before visiting any other funnel page. The funnel steps 1, 2, 3…. etc are meaningless, unless users can’t proceed to the next step before visiting the previous funnel page. As long as the required funnel page is viewed in a web session (which results in conversion), regardless of the order in which it is viewed, the conversions will be counted by GA. In our case, the required funnel step is the home page. So the funnel visualisation report would include only those conversions, in which the home page was viewed in a web session, regardless of the order in which it was viewed. Note: You can create multiple funnels for a single website goal, using the ‘required funnel step’ and can thus get deep insight into, how people are converting on your website. Viewing an empty funnel even after waiting for weeks, is one of the worst situation to be in. You can’t go back in time, fix the issue and get the historical data. Even if you fix the funnel set up now, the funnel visualization report will only show data going forward. The funnel visualization report can’t show data retroactively. That means you lost weeks of data, in your funnel visualization report for good. Therefore, before you set up any funnel in Google Analytics, always test it via to make sure, that you are going to get the data in funnel visualization report. Testing a funnel means, testing the URI of the Goal and funnel pages. 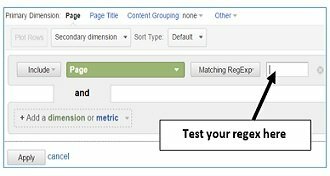 For example, if your regex for finding goal/funnel pages, is incorrect or there are capitalization issues, then you wont see any data or correct data in you funnel visualization report in GA . In case of GA standard, it could take up to 24 hours, for the data to populate in your funnel visualization reports. Whereas, in case of GA Premium, it can take up to 4 hours, to get the funnel data. One issue that can easily crippled your conversion optimization efforts, is the misinterpretation of funnel visualization report data. Such misinterpretation could lead to drawing wrong conclusions, which in turn, lead to making wrong marketing decisions. Many marketers assume that the number 2,037 in the screenshot below, denotes the number of people (users) who completed a goal conversion: But this is not true. The number 2,037 denotes the number of unique pageviews and not users. A unique pageview is the number of sessions during which a page was viewed once or more times. A unique pageview is counted only once during a session. So no matter how many times a user navigates to the same page in a given web session (or visit), the number of unique pageviews for the page will remain one. Also, the number of unique pageviews is not equal to number of users. This is because a user can navigate to the same page multiple times during multiple sessions and thus can generate multiple unique pageviews. For example, if a person view the home page three times in the first web session and 4 times in the second web session, then the number of unique pageviews for the home page would be 2 but the number of users would still be 1. Let us also supposed, all of this happened in a single web session. Now the funnel visualization report will not show the actual order in which these funnel steps were viewed. It would show an entrance to the home page, a continuation to the shopping cart page and an exit from shopping cart page to the home page. This happened because, funnel visualization report does not show ‘loop back’. The ‘loop back’ is the activity of going back to the previous step in a funnel. In our case, the user went back to the home page from the shopping cart page and thus created a loop back. So, people do not always move through your sales/conversion funnel exactly the way you set it up in Google Analytics. People can also enter or exit the funnel midway. Also note the number of unique pageviews for the home page. It is 1 despite the page being visited twice. This is because the home page has been visited twice in a single web session. Had it been visited in two different web sessions, the number of unique pageviews for the home page would be 2. User landed on the website via home page. User navigated to the ‘shopping cart’ page. User navigated back to the home page. User refreshed the home page for some reason. All of this happened in a single web session. We can also conclude that two ‘loop backs’ occurred in the actual conversion path. One loop back occurred when the user went back to home page from the shopping cart page. The second loop back occurred when the user refreshed the home page through his browser. an exit from the home page to the home page. The second loop back occurred when the user went back to shopping cart page from the home page. an exit from the home page to the shopping cart page. the user landed on the website via Product-A page. user navigated to the home page. We can also conclude that no ‘loop back’ occurred in the actual conversion path, as the user did not return to any previous step in the funnel. #2 A continuation to the shopping cart page from the home page. #3 An exit from shopping cart page to the ‘contact Us’ page. Since the ‘contact Us’ page is not one of the funnel page, the report won’t show continuation to the contact Us’ page. Instead it will show user exit from the funnel to the ‘contact Us’ page. user navigated to the contact us page. an exit from shopping cart page to the ‘contact Us’ page. Google Analytics simply checks, whether a funnel page was viewed during a web session and if it was, then that is represented in the funnel visualization report in the order in which you set up your funnel, regardless of the order in which the website users actually viewed the funnel pages/steps. user navigated to the Shopping Cart page. user navigated to the Checkout page. We can also conclude that no ‘loop back’ occurred, because the user navigated back to the home page and back to the shopping cart page, in a different web session. However since the home page and the shopping cart pages were viewed in two different web sessions, the number of unique pageviews for both home page and shopping cart pages would be 2. Whereas the number of unique pageviews for the checkout page would be 1, as it is viewed in only one web session (or visit). the user landed on the website via Home page. user navigated to the ‘order review’ page. Note: the user did not navigate to the shopping cart page and thus skipped it. When a user skips one of the steps in a funnel, which comes after the step, at which the user entered the funnel, then the funnel visualization report backfills the skipped step. 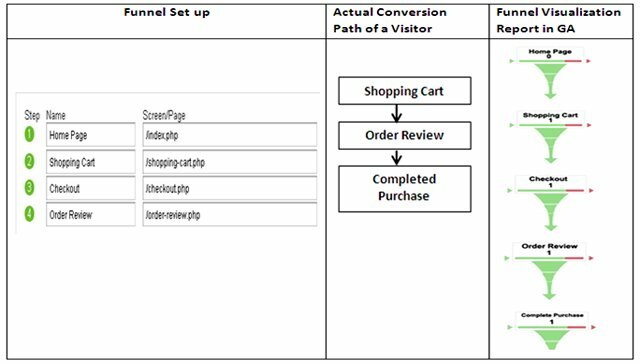 Here, the shopping cart page is the skipped step, which comes after the home page (the step at which the user entered the funnel) and hence it will be backfilled by the funnel visualization report. continuation to the order review page. user navigated to the ‘Completed Purchase’ page (which is the goal page). Note: the user did not navigate to the Home Page and Checkout pages and completed skipped them. 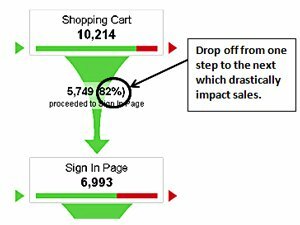 Since the home page is the skipped funnel step which comes before the ‘shopping cart’ page (the step at which the user entered the funnel), it will not be backfilled by the funnel visualization report. So number of unique pageviews for the home page would be 0. 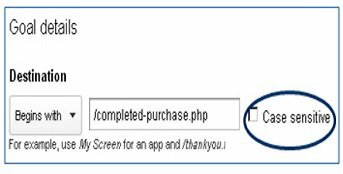 The checkout page is also the skipped funnel step but it comes after the ‘shopping cart’ page (the step at which the user entered the funnel), therefore it will be backfilled by the funnel visualization report. So number of unique pageviews for the checkout page would be 1.
an entrance to the shopping cart page. continuation to the checkout page. continuation to the ‘competed purchase’ page. user navigated to the about us page. user navigated to the sign up page (which is the goal page). user again navigated back to the home page. user again navigated back to the membership page. user again navigated back to the sign up page but this time on behalf of his wife. So here the user has repeated the funnel twice and completed the goal conversion (signup) twice. 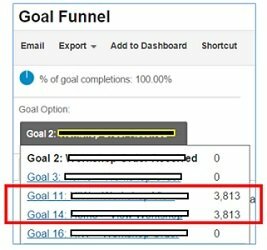 But in the funnel visualization report a goal is incremented only once during a session. So no matter how many times the user signup for the membership, in a single web session, you will see only one 1 signup in the funnel visualization report. The goal will be incremented in the funnel visualization report, for the same user, only when he converts again in a different web session. So here the user has repeated the sales funnel twice and placed the order twice. If a user place two or more different orders in a single session, then they are counted by GA as unique transactional goals, regardless of whether the order was placed in the same or different session. So in the case of sales funnel, a transactional goal will be incremented in the funnel visualization report, for the same user, every time he/she places a new order, regardless of whether the order was placed in the same or different web session. So if we can make more website users, to reach to the shopping cart page, we can generate more sales. Now the problem is, we don’t know which website users (whether users from organic search, Paid search, email campaign or social media etc) are exiting the funnel in great numbers. 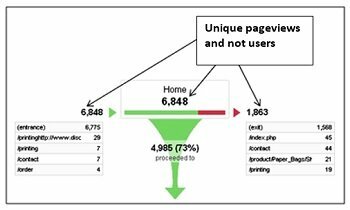 Without segmenting this funnel, there is no way we can determine the main reason of users’ drop off from the home page to the shopping cart page. Unfortunately, Google Analytics doesn’t allow segmenting the funnel visualization report on the fly via advanced segments. When you modify an existing funnel setup in Google Analytics, you won’t be able to see historical data for that funnel. This is because Funnel visualization report only shows data going forward. It can’t show retroactive data. In order to understand how different traffic segments convert in Google Analytics, you need to segment the funnels. Step-2: Set up goals and funnel pages for each filtered view. Step-3: Wait for at least a month, so that enough traffic data populates, into the funnel visualization report of each filtered view. Once the 30 days of data has populated into the funnel visualization reports, you are ready to interpret goals/sales funnel for each traffic source. Note: When you use the date comparison feature of the funnel visualization report, Google Analytics doesn’t show you the difference for different funnel steps. It only show you the difference in the total conversion rate for the funnel goal. If you manage a high traffic website (million of pageviews each month) then you simply can’t afford to ignore data sampling issues. When Google Analytics is sampling your data badly, you can’t blindly rely on the metrics reported by it. Then there is always a strong possibility, that the reported metrics are 10 to 80% off the mark. 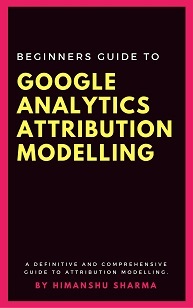 If your funnel visualization report is based on more than 100k sessions then Google Analytics is going to sample the data, whether or not you use GA Premium. So in order to fix data sampling issues, run the funnel visualization report, for shorter time frame which should include less than 100k sessions. Many marketers take marketing decisions based on small time frame or small data set. You can’t determine the best conversion path used by your website users and then optimize your conversion funnel, just on the basis of few weeks of data or handful of conversions. You need at least one month of data in your funnel visualization report before you can take marketing decisions or even consider funnel optimization. If you have a low traffic website, getting enough conversions in the desired time frame is difficult. Your best bet is, to buy some extra traffic (via PPC or ads on social media) so that you can validate your tests/assumptions faster. Make sure that you always use descriptive names for funnel steps as they show up in your funnel visualization reports. Use a name which describes what the goal /funnel page is all about. Don’t use names like ‘step-1’, ‘step-2’ etc. 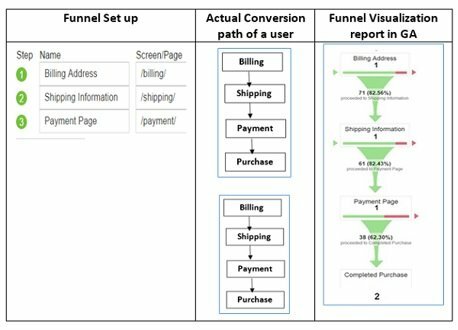 There is no impact of the funnel pages / steps you create, either on the conversion rate (both Goal conversion rate and ecommerce conversion rate) or on the conversion volume (like goal completions, number of orders) in your funnel visualization report. The funnels you define affect only your funnel visualization reports. The other thing which is worth mentioning is that the Funnel conversion rate is not the same as goal conversion rate or ecommerce conversion rate. The Funnel conversion rate is the percentage of funnel sessions which result in conversions. These conversions can be goal conversions or e-commerce transactions. #2 The number of unique pageviews is not equal to number of users. #4 A funnel visualization report does not show loop backs (i.e. going back to the previous funnel steps). #5 A ‘Loop back’ is not counted, if the same funnel page is viewed in two or more different GA sessions. #6 Funnel Visualization report shows continuation only from the funnel pages. #7 Google Analytics report the funnel pages, in the order in which they were set up, not in the order, they were viewed. #8 The order in which you have set up your funnels steps in GA, is the order in which your funnel steps will appear in the funnel visualization report. #9 Funnel visualization report simply show the funnel pages that were viewed in a web session(s). #10 GA backfills those skipped funnel steps which come after the funnel step, that was viewed in a web session. #11 GA does not backfill those skipped funnel steps which come before the funnel step, that was viewed in a web session. #12 A non-transactional goal is counted only once in a web session no matter how many times a user completes that goal. #13 The goal will be incremented in the funnel visualization report, for the same user, only when he/she converts again in a different web session. 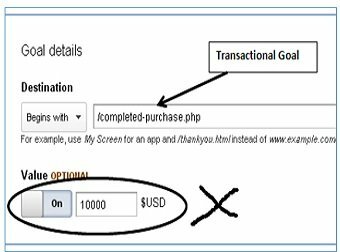 #14 A transactional goal will be incremented in the funnel visualization report, for the same user, every time he/she places a new order, regardless of whether the order was placed in the same or different web session. #15 Always segment the Google Analytics Funnel Data. #16 Never ignore Data Sampling Issues while reading the funnel visualization report. #17 Never Use small time frame and small data set for your funnel analysis. 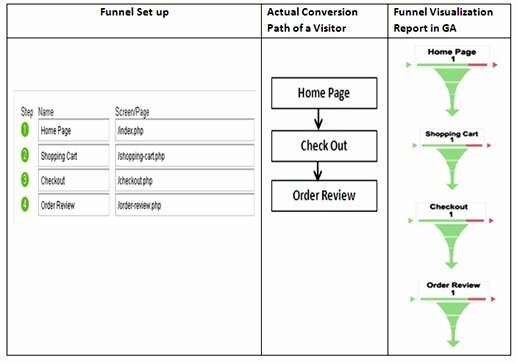 #18 There is no impact of the funnel pages / steps you create, either on the conversion rate (both Goal conversion rate and ecommerce conversion rate) or on the conversion volume (like goal completions, number of orders) in your funnel visualization report. Website Users add items to the shopping cart. The users who have added items to their shopping cart make a purchase. #1 Cart to detail rate – it is the rate at which users add product to the shopping cart after viewing the product details. #2 Buy to detail rate – it the rate at which users buy products after viewing the product details. #3 Product Adds to cart – it is the number of times a product was added to shopping cart. #4 Product Removes from cart – it is the number of times a product was removed from the shopping cart. #5 Product Checkouts – Number of times a product was included in the checkout process. #1 You send highly targeted traffic to the website. This is one of the main requirements. #2 Your website is visually appealing. Design matters a lot. #3 Your products are enticing. #4 Your offers create a sense of urgency. For example: “Order in the next 2 hours and get ……. “. #5 Your landing pages have got clear call to action. Focus on improving your ‘Product Adds to cart’ rate to increase the probability of generating more sales. Note: Make sure that you segment the ‘Product Adds to cart’ rate to its most granular level before you interpret it. All the data in aggregate form is crap. Asking people to add items to the shopping cart is the easy bit. Asking them to complete the purchase is hard. If you want website users who have added items to their shopping cart, to make a purchase then don’t give them nasty surprises during the checkout process. Each additional funnel step, gives the opportunity to a customer to leave the funnel and not convert. Therefore you should aim to minimize the number of funnel steps. Any extra charge/fees during the checkout process, can immediately put off a customer and can cause him to exit the funnel straightaway. Therefore be upfront with your prices as much as possible. It is one of the best way, to put off a customer from converting. Never force a person to register in order to complete a purchase. Ask him to register only after the sale has been made. Sometimes people don’t convert just because they don’t want to register. For such people provide a guest checkout option. Your first priority should always be generating the sale. The last thing you want your potential client to do, is to add a product to his shopping cart, which is out of stock and he comes to know about it, only during the checkout. Make sure that the out of stock products can’t be added to shopping cart by any person. Cross promotion can result in increase sales when done in a moderate amount. But when you try to shove multiple products down a person’s throat, it can put him off from converting. Godaddy is pretty notorious in cross promoting its products. You try to buy one domain and it will try to shove every product in its catalogue right down your throat. Avoid doing too much upselling. When you ask same information multiple times during the checkout, you are literally telling your customers to exit the funnel right now, or I will haunt you by asking same question over and over again. 7. You must collect users email addresses in the first few steps of the checkout process so that you can use the email later, for remarketing purpose, in case the user abandon the shopping cart. Remarketing is proven technique to decrease the checkout abandonment rate. Sometimes poor navigation does not allow a person to go back to a funnel step to make some changes. In such case, he can either choose to restart the checkout process or exit the funnel for good. Lot of people choose the later option. The worst thing your customer could experience during checkout, is that, his desired payment option (like Paypal) is not available. So even when he was ready to pay, he could not pay to you. So provide as many payment options as possible. Any technical error can cause your customer to loose all the filled information on a form. Forcing your customer to retype the information is a fire shot way to loose him for good. So always make sure that your checkout process is error free. You should aim to keep your Checkout abandonment rate as low as possible. In order to better understand the Checkout abandonment rate, segment this metric to its most granular level using Google Analytics filtered views.